German premium automaker, Audi has announced the launch of the new Audi R8 supercar in the fast growing Indian market. Audi has now replaced the R-Tronic Transmission with a 7-Speed S-Tronic Transmission in the new 2013 R8 version of the super car for the Indian market. The improvement will allow drivers to change gears faster and in a much smoother manner. The company will also offer 6-Speed Manual transmission. The R8 V10 Plus features the same carbon-fibre reinforced plastics as the R8 GT. The model is powered by a re-tuned 5.2-liter V10 with 550 HP of power and 540 Nm of torque. The entry level version of the car will come with 425bhp V8. Audi is also offering new and stylish lights, bumpers, grille and diffuser on the exterior. Michael Perschke, Head, Audi India announced on his twitter account that the company is set to launch the new Audi R8 sportscar in the Indian market. The model will be the most advanced sportscar in the country and will be launched in Delhi today. 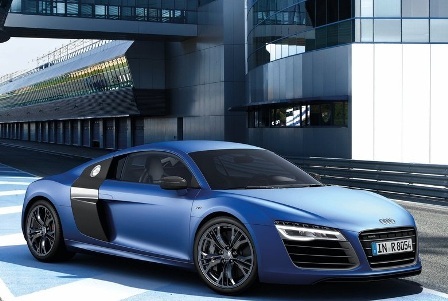 Besides the R8 model, the company will launch a special edition of 2013 Audi R8 in the country.